Venue: Flushing Meadows, New York Dates: 27 August-9 September Coverage: Live radio commentary on BBC Radio 5 live sports extra and text updates on the BBC Sport website. 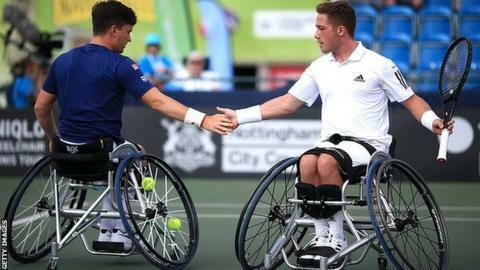 Britain's defending champions Alfie Hewett and Gordon Reid beat Argentina's Gustavo Fernandez and Japan's Shingo Kuneida to reach the men's wheelchair doubles final at the US Open. They triumphed 7-5 4-6 10-6 after a championship tie-break. The match had been postponed at the end of the first set on Thursday night because of thunderstorms. Hewett and Reid will take on top seeds Stephane Houdet and Nicolas Peifer of France in the final. Hewett also advanced to the wheelchair singles semi-finals after fighting back from 5-2 down in the first set and 4-1 in the second to beat Belgium's Joachim Gerard 7-5 6-4. It was an impressive performance from the 20-year-old, who had to sleep on the floor at Chicago airport on Monday night after experiencing major problems on his journey to New York. The world number two will face Fernandez in the last four after the Argentine overcame Reid 6-1 6-4. Britain's Lucy Shuker and German partner Sabine Ellerbrock lost their women's doubles semi-final 6-0 6-0 to top seeds Diede de Groot of the Netherlands and Yui Kamiji of Japan. Shuker also lost 6-4 6-4 to South Africa's Kgothatso Montjane in the women's singles quarter-finals. Fellow Briton Andy Lapthorne beat American Bryan Barten 6-1 6-4 but lost 6-4 6-2 to top seed David Wagner in quad singles round-robin matches.